For many people, autumn brings around a wave of joy and inspiration as this season is a sign of vivid change. The air becomes crisp and light, University and Schools are back after a long summer’s holiday and then- the leaves turn golden brown and red, filling the streets with splashes of colour! With autumn also comes the ever increasing love for most things pumpkin! Pumpkin scented candles, pumpkin flavoured coffees and also – the beautiful and warming taste of pumpkin bread! 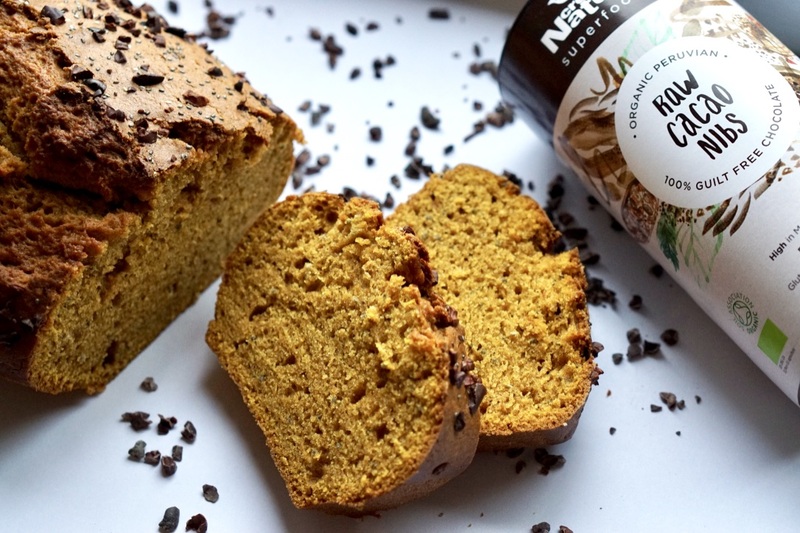 Therefore, today we are bringing your our recipe for a delicious, moist and very easy-to-make pumpkin bread that features our delicious Chia Seeds and Cacao Nibs to add a bit of a twist, some fibre and delicious texture! Some additional Chia Seeds and Creative Nature Cacao Nibs for topping! Firstly, mix all the wet ingredients together in a large bowl along with the sugar until a uniform mix is made. In a separate bowl- mix the the remainder of the ingredients and then pour into the wet mixture. Then mix all the ingredients together and pour into a greased loaf tin. Sprinkle with Cacao Nibs and Chia seeds and bake for 1 hour to 1 hour and 10 minutes at 180 degrees C. The pumpkin bread is done when a toothpick inserted into the centre of the pumpkin bread comes out clean. Take the baked pumpkin bread out of the oven and let it cool for 20-30 minutes before taking out of the loaf tin. Allow to cool completely and enjoy!